When reading the labels on fertilizer packages, you may have come across the term “chelated iron” and wondered what it is. As gardeners, we know that plants require nitrogen, phosphorus, potassium and micronutrients, such as iron and magnesium, to grow properly and produce healthy blooms or fruit. But iron is just iron, isn’t it? So exactly what is chelated iron? Continue reading for that answer, and tips on when and how to use chelated iron. Symptoms of iron deficiency in plants can include chlorotic foliage, stunted or malformed new growth and leaf, bud or fruit drop. 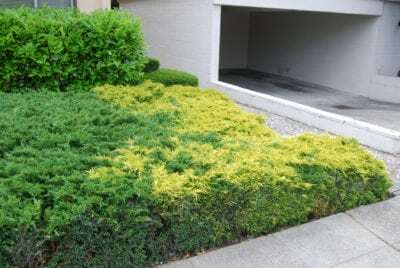 Usually, symptoms do not progress more than just discoloration of the foliage. Iron deficient leaves will be green veined with a mottled yellow color in the plant tissues between the veins. Foliage may also develop brown leaf margins. If you have foliage that looks like this, you should give the plant some iron. Some plants can be more prone to iron deficiencies. Certain soil types, such as clay, chalky, overly irrigated soil or soils with high pH, can cause available iron to become locked up or unavailable to plants. Iron is a metal ion that can react to oxygen and hydroxide. When this happens, the iron is useless to plants, as they are not able to absorb it in this form. To make iron readily available for plants, a chelator is used to protect the iron from oxidation, prevent it from leaching out of the soil and keep the iron in a form that the plants can use. Chelators may also be called ferric chelators. They are small molecules that bind to metal ions to make micronutrients, such as iron, more readily available to plants. The word “chelate” comes from the Latin word “chele,” which means lobster claw. The chelator molecules wrap around metal ions like a tightly closed claw. Applying iron without a chelator can be a waste of time and money because the plants may not be able to take up enough iron before it becomes oxidized or leached from the soil. Fe-DTPA, Fe-EDDHA, Fe-EDTA, Fe-EDDHMA and Fe-HEDTA are all common types of chelated iron that you may find listed on fertilizer labels. Chelated iron fertilizers are available in spikes, pellets, granules or powders. The latter two forms can be used as water-soluble fertilizers or foliar sprays. Spikes, slow-release granules and water-soluble fertilizers should be applied along the plant’s drip line to be most efficient. Foliar chelated iron sprays should not be sprayed on plants on hot, sunny days.